The dilemma was what to call it. "It" was a rabbit I'd braised in a wine and tomato broth to which mushrooms and pearl onions had also been added. I'd heard that rabbit tastes like chicken, so I decided to prepare it as I would a braised chicken. I had the ingredients I needed to make a sauce that resembled the one I use to make Chicken Marengo. I decided to go with that and, fortunately, it worked. Rabbit, by the way, doesn't taste like supermarket chicken. It's more like the dark meat of a free range chicken. It's not at all gamey and, while this will never be a favorite of mine, we'll have it again because Bob loves it. I'll be experimenting with sauces and techniques, so prepare yourselves for plethora of rabbit recipes. Bob was able to buy the rabbit at a local bodega that sells frozen game. Our rabbit was farm raised so I can't speak to the texture or flavor of a jackrabbit. This was really easy to prepare and comes recommended if you really want to cook a rabbit. I served it with rice pilaf. Polenta would also be a great accompaniment. 1) Mist rabbit pieces with nonstick cooking spray. Season rabbit pieces with salt and pepper. Dredge if flour, shaking off excess. 2) Heat oil and two tablespoons butter in a large skillet over medium-high heat. Add rabbit pieces and saute until golden, about 4 minutes per side. 3) Add tomato paste, garlic, vermouth, chicken broth, bay leaf and thyme. Stir to combine. Bring to a boil, cover, reduce heat to medium and simmer for 45 minutes, turning pieces once or twice. 4) Meanwhile, melt reserved 1 tablespoon butter in a large saute pan. Add onions, sprinkle with 1 tablespoon sugar and cook until lightly brown. Add mushrooms and brown. 5) Add onions and mushrooms to rabbit; cook, covered, for 15 minutes longer. Adjust seasoning with salt and pepper to taste. 4) Transfer contents of skillet to a serving platter. Tent with foil to keep warm. Rapidly boil stock until thickened. Spoon over rabbit. Garnish with parsley sprigs. Yield: 4 servings. My hubby is so happy you posted this recipe. Where did you buy the rabbit? Jo, we have a Mexican grocer who stocks frozen game and rabbit. I think you should be able to get it in Portland. Check with family owned grocery stores in Mexican or Italian neighborhoods. I have never had rabbit and honestly, I probably will never, ever. I do have to say that I would TOTALLY try the sauce over chicken though because it does look amazing. We're very fond of rabbit, or lapin as the French call it. Also love Chicken Marengo so I can understand how they go well together. 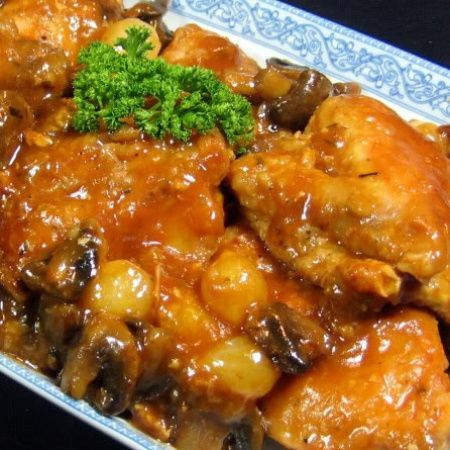 We had rabbit a couple of weeks ago and I used a Chasseur sauce which is similar to Marengo with mushrooms and onions and it turned out great. I can't wait to tell my husband I have a new lapin recipe - thanks so much. Totally not worth the effort, but totally fun is whack of wabbit... I mean, Rack of Rabbit. The bones are so tiny and cute! This looks great and look forward to seeing more neat ideas for rabbit. I grew up eating rabbit baked in wine sauce and whenever it is on the menu in Europe, I order it. Just love it. The small bones which can splinter are often not appetizing, but it is a marvelous meat and I am really surprised it is not offered more in America. I'd be happy to sit down and enjoy this meal with you. I have never had Rabbit but would really like to try it. Your sauce sounds exceptionally delicious!! The picture is gorgeous but I don't think I would be able to eat rabbit. However, I would love to try this recipe on chicken, my mouth was watering reading the indgredients and I have everything at home to make this...might be something to try tomorrow night! I love rabbit it is so hard to find here also. Wow what a dish. You are always at the top of my list. I love rabbit...and that looks really yummy! SleightGirl, it is really easy. I just wanted to welcome you to One Perfect Bite. I hope you'll become a regular visitor. I have yet to ever try rabbit but it does look amazing. I've never had rabbit. I'm intrigued. I have never had rabbit either, I think it needs a marketing board to change the name for the meat, like they did for beef and pork. One day I will be brave and give it a shot, I admire you for stepping outside your normal comfort zone. The sauce sounds amazing but I think I'll make it with chicken - I can't help but picture a cute little bunny and I just don't think I could eat one. I have never had rabbit, I have to admit I'm afraid. It looks beautiful though. This is a gorgeous dinner! I like rabbit, don't eat it often...but I'd love to try it like this! Looks fantastic--I love braised meat, although I have never had rabbit either. This is a gorgeous dish and what I not only love to make, but love to eat. I love rabbit, though the family isn't crazy about it, but this would be such a treat! That looks really delicious. I wonder if I would be so brave. I tell my husband that we have to get a trap because if times get tough, real tough, economically we will be giving the rabbits in our yard a run for their money! I've never eaten or cooked rabbit before, but it's something I'd like to try if I ever have the chance. It looks very interesting ! My husband hunts rabbit, so we do eat rabbit occasionally. Although it doesn't taste exactly like chicken, it is very similar. If you are preparing jack rabbit yourself, it should be soaked in salt water overnight before freezing or preparing. This will take the "gamey" taste away and will also make the meat less chewy. Your dish looks great, and I will be trying this recipe soon! thank you! Welcome 3timesamom and thanks you for the tips on jack rabbit. I hope you'll visit with us often. I can picture the look on Dad's face while he holds up the rabbit looking so proud of himself! !